Sometimes when you're giving a presentation, and audio clip can really help illustrate a point. 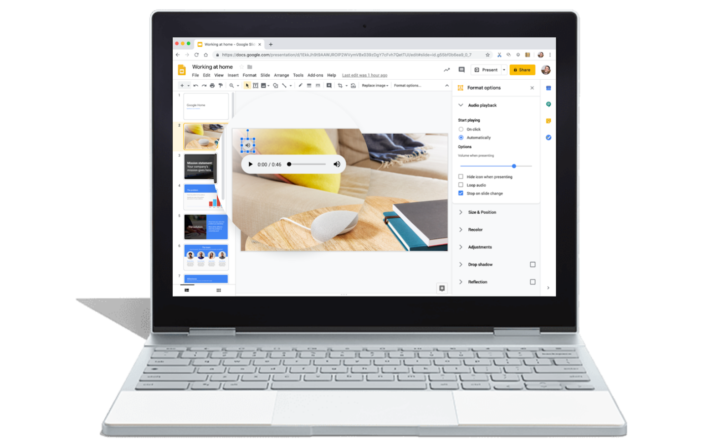 Up to now, there is no way to play that audio alongside a Google Slides slideshow, but Google has announced that the option to embed audio clips directly into presentations is coming. Once the feature is available, you'll be able to to add MP3 and WAV files to presentations by navigating to Insert > Audio. You'll have options to move the play button around, replace it with an image of your choosing, or hide the altogether. The rollout to G Suite users is starting today and should be complete by early May. There is no timeline for availability on non-G Suite accounts, but if history is any indication, it won't be too long. Look forward to hearing Pharrell's "Happy" during a Monday morning sales meeting in the near future.